I told you we got a goat - isn't he magnificent? Not exactly sure what we're going to do with him yet, but he's just bursting with potential. And he looks great in all our finished knitted things. He's a big boy, so you can't miss him when you come to the LRB. The Golding Spindle Project. Tom Golding is going to make Jacob's Reward Farm spindles as soon as we have an order for 20 of them. They will be either walnut or cherry, and have our logo laser engraved on the top of the whorl. 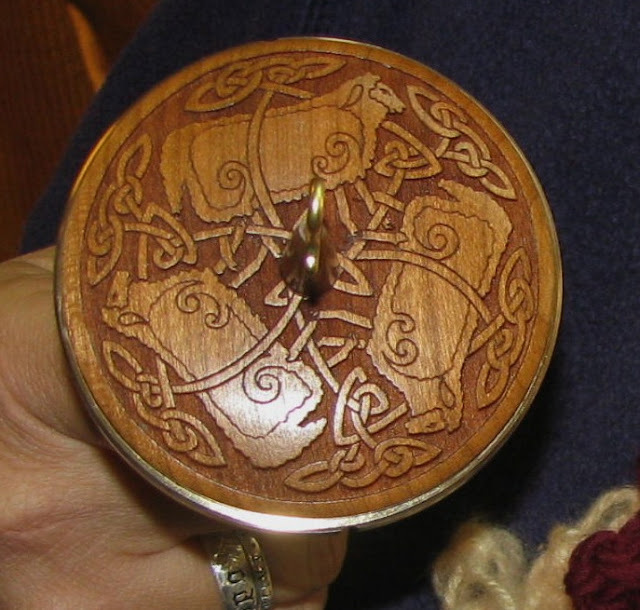 The picture is the gorgeous Golding spindle I got for Christmas from my dear friend Karen. Aren't those Celtic sheep wonderful? And it spins like a dream - the Lamborghini of drop spindles. Can not wait to have one with the JRFF logo! Let me know if you'd like to be on the list of the first 20--they'll run $87 each (an awesome price). I'll gather the capital and we'll give Mr. Golding the go-ahead to start the project. We're about half way there, last time I checked. Mr. Jonah boarded the trailer for the trip down to Goldthwaite yesterday, and made the journey just fine. 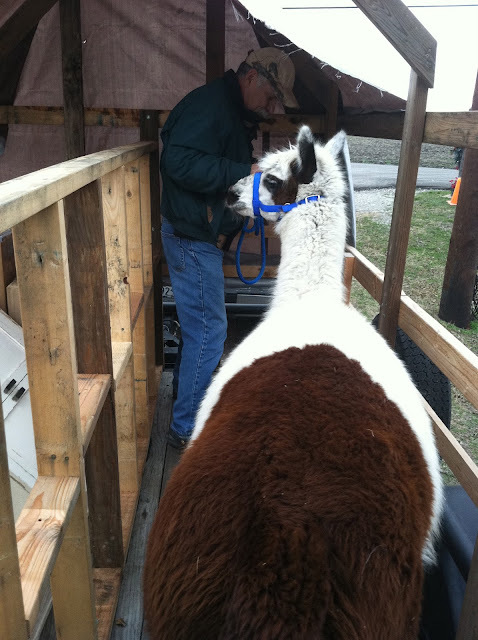 Barbara called today to tell me he made it through the night in his new pasture with his new friends - several alpacas and some llamas. They'll make friends in time. We'll miss him and his funny brown pants, but we'll also be very anxious to get our new gray boy here from Levelland. We've gotten some wonderful suggestions for names, and I think one name in particular has moved ahead in the polls. More information coming later on that one. Can I top off your nog? Hope your New Year calebrations go with a spin or a twist! Lovely looking spindle! Like you I can't wait to see JRF on there! Baby, daughter and Son-in-law, will be here for our New Year Celebrations! an' wait!! Happy New Year Everyone out there in Jacob's Reward Land (that includes animals as well as people)!